Update 2 Feb 2019 -Trip is FULL. Update confirmed flight and revised trip cost accordingly. Update 20 Jun 2018- We had been having full trips for both our May and Sep trips for the last 15 years. This is one of Yongo's popular trips. Do registered your interest early. We have also included Hua Shan mountains in the trips from 2009 and Colorful Danxia Lanform 2014. Flight below is based on 2017 flight schedule and will update accordingly. We will provide the confirmed flight in early 2019. Please email rachelheng123@gmail.com or call mobile 012-352 0868. This is meant to be a "free and easy" adventure trip. Participants should be relatively fit, with a good sense of humour, and above all, have the right attitude for close travel with others through possibly some trying times. Most definitely, this is not a trip for prudes, whiners, fuss-pots, and other similiarly assorted types! We had a couple of those before and it wasn't pleasant for us or them. 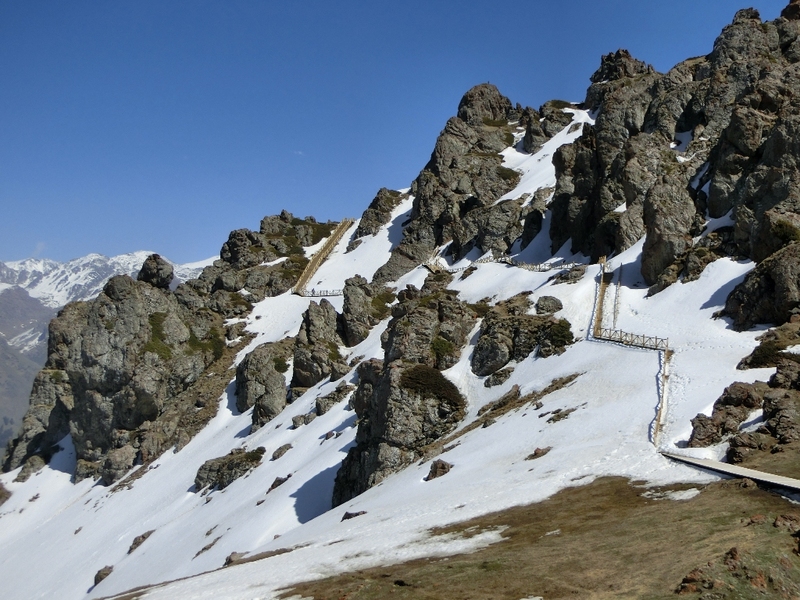 Although every effort will be made to stick to the given itinerary, ground conditions may change and cause some disruption and/or deviation from the norm. Otherwise, have fun! Uighur Xinjiang is quite likely the least “Chinese” part of China , and this is where we begin to run through the gamut of sites and landscapes that has seen likes of Marco Polo and others of his like! We traverse the snow-capped pine-clad mountains of Tianchi, and the next will be in the giant sand dunes of Dunhuang, past the miraculous grape oasis of Turpan in the middle of dry and hot nowhere! Han China looms with the so-called end of the Great Wall at Jiayuguan before ending our silk road sojourn in Xian, visiting the Tibetan towns of Xining & Xiahe. All in all, a fine adventure, but certainly the journey will not be smooth as silk! We hire buses most of the way and have three overnight trains (soft sleepers 4 pax per compartment) that will save us traveling time. We stay mostly budget hotels except for 1 night in Tianchi Lake. Here accomodation is very basic and we sleep in Yurts or Mongolian Tents near the water's edge, pictured above. Day 1 KUL Chongqing : Meet KLIA2 airport at 1820pm for night flight. Take Air Asia flight D7808 to Chongqing departs at 2020PM. Reached 0045AM. Transfer to hotel overnight. O/N Chongqing. Day 2 Fly Urumqi : After breakfast will transfer to airport to catch up flight to Urumqi. We will take either 3U8553 depart 1205PM reached Urumqi 1610PM OR 3U8759 at 1315PM reached Urumqi 1710PM. Transfer to hotel. Free & Easy. O/N Urumqi. Day 3 Urumqi: On this day we use the convenient public buses to move about in Urumqi. This leaves members the option to skip certain places and also to come back earlier. We visit Remnin Peoples Park to view hundreds of residents participating in various morning exercise routines. 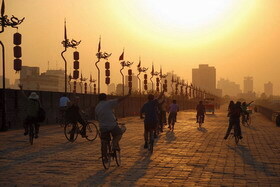 Later we visit the touristic Hongshan Park and the Xinjiang Autonomous Region Museum. We spend the rest of the day at the Erdaoqiao Ethnic Market and the Grand Bazaar. Great eating available at the numerous Uighur restaurants. Overnight (ON) Urumqi. Day 4 Tianchi: On to Tianchi Lake 120 km 2.5 hrs from Urumqi. We will spend most of the day wonder about the lake area aka as the Swiss Alps of China. 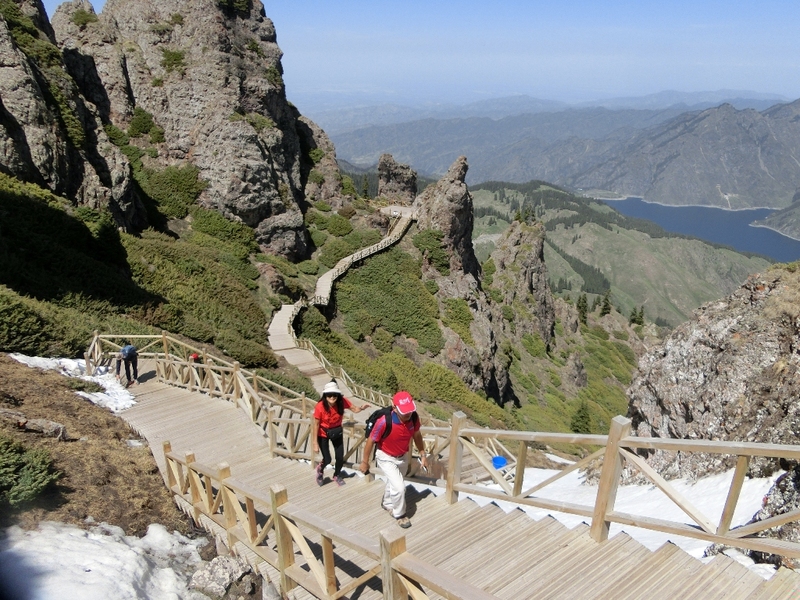 Group can opt go for cable to overview beautiful Tianchi. ON Tianchi or nearby town. Day 5 Turpan: After breakfast, we bus to Turpan 160km 2.5-3hrs, also known as the grape capital of China. We should arrive in time for a visit to the Karez Wells and the nearby Jiaohe ancient city, a UNESCO site. ON Turpan. Day 6 Turpan: We'll start in the early morning to climb the 1,308 steps up to the top of Flamming Mountains with great views of Tianshan mountains and Turpan Valley. There are some grape vines ares below this same mountain. Then we move back to Turpan to browse the colourful Uighur market. Free and easy or we can go to visit the local Village. We then drive on the train station at Daheyan 40 min for the overnight train to Dunhang departing at 2047pm. ON soft sleeper train. (Important note - Train ticket bookings is only available 5 DAYS BEFORE TRAVEL for Groups and Individuals alike. During peak travel period, it's a big problem buying the most comfortable soft-sleeper places. During slow months of May, July and September, chances are best. In the event, our Agent is not able to secure soft-sleepers, they will purchase hard-sleepers. The cost difference will be returned either in cash or credited to account back in Malaysia). Day 7 Dunhuang:We will arrive at 0411am and we'll spent some time browsing the interesting Dunhuang local market. After lunch we make our way to the UNESCO listed Thousand Buddha Caves at Mogao. We will have some free time in the evening going back to the markets to enjoy the local food. ON Dunhuang. Day 8 Dunhuang:The sand dunes of Minshashan or Singing Sand Mountains are best visited in the early morning. 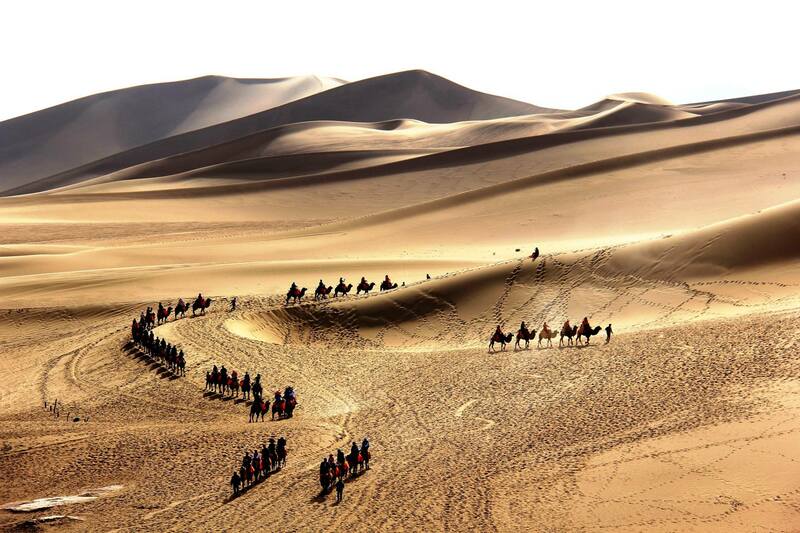 These are the highest dunes in China. Bactrian camels rides are popular with tourists to move about this pretty desert area but walking is cheaper and better for photo-taking. We lunch in town and in the afternoon, we have the option of hiring bicycles (cost Y10) to visit the surrounding farms and villages. ON Dunhuang. Day 9 Dunhuang/Jiayuguan (380km 5hr) :We bus to Jiayuguan 380 km 5 hours and visit Jiayuguan famous Fortress located at the Western end of the Great Wall of China. We also visit some Wei and Jin Dynasties Tombs, built some 1700 years ago. 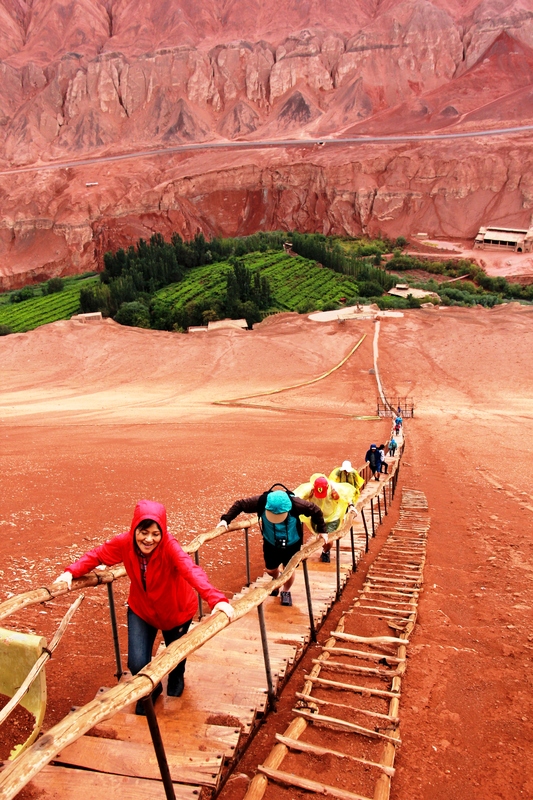 Located some 20km from Jiayuguan, it is famous for its brick wall paintings depicting scenes from everyday life from tea-making to silk production. Day 10 Jiayuguan/Jiuquan/Zhangye/Lanzhou:Today we driving to Jiuquan visit the Jiuquan Park, the name of "Jiuquan' got its name because of the General Huoqubing, who defeated the Huns in Western Han Dynasty - 2 Century BC in Hexi Corridor, the Emperor Wudi awarded him a jar of wine for his victory. General Huo poured the wine into spring and enjoyed its wine with all the soldiers. 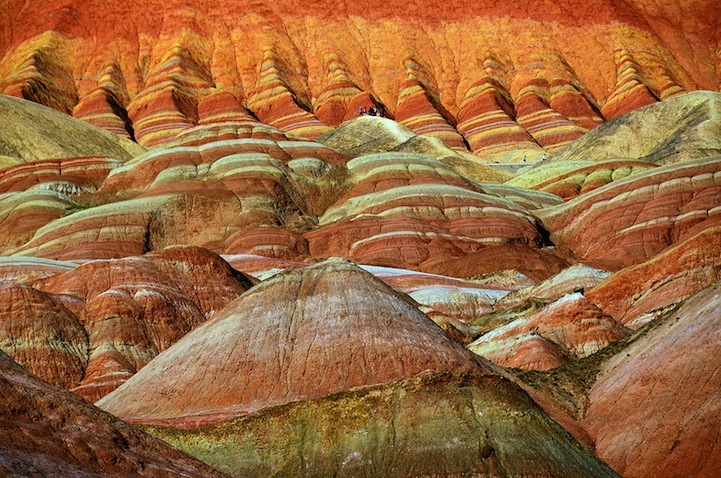 Will drive to Zhangye after lunch and reach the Zhangye Colourful Danxia Landform- one of six beautiful Landform in China, the best time to visit the landform is in the late afternoon. Dinner then catch the fast train to Lanzhou. O/N Lanzhou. Day 11 Xiahe: We start the day early to enjoy the scenic drive to Xiahe on part of the Qinghai Plateau. This less-frequented route is dotted with quaint and pretty Muslim Hui and Tibetan farms and villages. The rolling high altitude grasslands with flocks of yaks and sheeps are especially pretty. 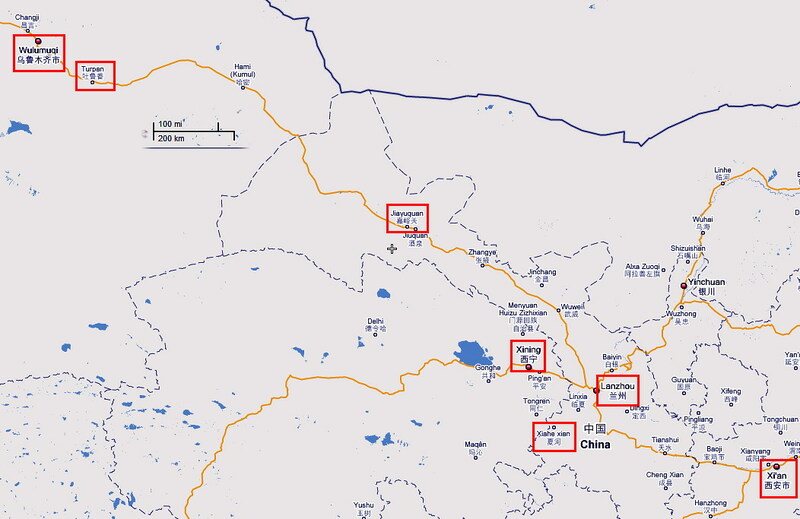 Will visit Labrang Monastery that is reputed to be more Tibetan than Tibet itself. We'll have adequate time just walking around and taking in the atmosphere. ON Xiahe. Day 12 Lanzhou-Train:We bus to Lanzhou 4hr. We visit the banks of the Yellow River and its water-wheels and sheep-skins rafts. We also visit the White Pagoda Hill if time permit. Take fast train to Xian. ON Xian. Day 13 Xian: After breakfast visit musuem and then the Unesco's Terracotta Warrior and some of the other sights. After sightseeing in Xian, we will heading to Lintong, so group can go to Huanshan in next early morning. ON Lintong. Day 14 Hua Shan Mountain: This is a full day tour to one of five scared mountains in China, located 120km from Xian. There are some scary climbs up chained platforms. There are also cable car rides available for the regular tourist. ON Xian. Day 15 Xian: Free & Easy in Xian for wandering the Old City. Cycling atop the Walls to view the Old City is recommended. ON Xian. Cost cover accommodations, bus and rail transport. Accommodations will be in budget hotels and guesthouses. Airport transfers and inter-town travel by chartered bus and local train are covered. Cost above is based on availability of "4 person cabins" (Note : soft sleeper) on the train. Cash difference refunds will be made if we use "6 persons cabins" (hard sleeper). Not covered are Air ticket (KL-Chongqing, Chongqing-Urumqi & Xian-KL) (appx RM1600), China visa fees Rm100, meals except for Tianchi Lake, in-town taxis/bus, extension hour for the room, entrance fees, bicycle hire and horse trek in Tianchi. Note that entrance fees in China are HIGH and expect to pay about Rm950 for the numerous places we cover on this extensive itinerary. The one day where we move about in Urumqi by public buses/taxis is also not covered, about Rm10. Estimate meals between Rm30 to Rm60 per day, for the balance 15 days totals Rm450 to Rm650. Guides accompanying group do expect tips. Yongo encourages group members to be generous but should commensurate with services rendered. A deposit of Rm1100 is payable to confirm your place. Cost is subject to change if there's a significant changes in foreign exchange rates and airfares.